While some may have naturally fast metabolisms, everyone can benefit from a healthier diet. A protein-rich diet helps the muscles recover from a workout and grow stronger. Many people supplement their diet with protein powder, as it is a quick way to get protein into the body. The most common way protein powder is consumed is through protein shakes. These shakes can be consumed either before or after a workout. As long as your body is getting the protein it needs to build muscle after a workout, you are in good shape. 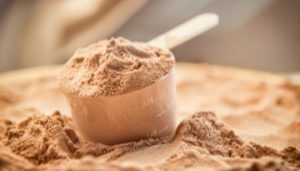 To figure out how much protein you should be intaking while trying to gain muscle, there are a few factors to consider. The average sedentary woman needs about 46 grams of protein per day, while the average man needs about 56 grams. This need for protein increases when one starts building muscle, as the protein helps heal the muscles so that they can grow. If you are planning any particularly strenuous exercises, make sure that you eat enough calories to give your body the energy it needs to build muscle. While those who are concerned with losing weight may search for more low calorie foods, it is expected that a person will gain weight in the process of building muscle. Whether you are hitting the bench presses and lifting weights to tone your upper body, or doing squats and lunges to tone your lower body, understanding how your muscles are targeted during a workout can maximize efficiency. Knowing which area of your body you want to focus on can inform your exercise choices. Your muscle fibers adapt to the type of exercise you do, so it is important to have a plan. There are 11 muscle groups in the body, and these correlating workouts are specified to target those areas. How many reps you do between rest periods is a factor to consider when you are learning how to build muscle fast. When it comes to strength training, having rest periods in between reps are important so that you can ultimately continue your workout longer than if you did not have rest periods. Arguments have been made for how many reps are considered ideal for muscle gain, but it may come down to knowing yourself and what your body responds to. A lower number of reps, such as 5, would be ideal for someone just starting out with weightlifting. If you are new to weightlifting, you can work your way up to a higher number of reps (15) with time. If you are unsure where you fall, a moderate number of reps, such as 10, is always a safe bet. If you are ready to put on pounds of muscle, start with a Houston gym known for its elite training. O Athletik has state-of-the-art equipment to target every muscle group in the body, as well as personal trainers ready to help you reach your goals and fitness classes that will keep you on your toes.